The cultural hub of Cleveland can be found in the city’s University Circle area, and sitting in the middle of it for the past 60 years is the wonderful Cleveland Museum of Natural History. Full of interesting exhibits, the museum has a great fossil collection, including one of the most fearsome predators of the Devonian Period that was discovered nearby. The Cleveland Museum of Natural History (CMNH) has long been a major research museum and today houses some significant displays, particularly in the areas of human evolution and fossil fish (and plants) from the Cleveland Shale, a deposit from the Late Devonian that is about 360 million years old. These are exciting times at CMNH, as the museum is undergoing a comprehensive plan to modernize and grow its exhibit areas. While it has been in University Circle since 1958, the CMNH first opened in 1920, and the museum is coordinating the expansion and renovation work to coincide with its centennial in 2020. There are quite a few fossil highlights at CMNH. Just past the lobby visitors can see a cast mount of the dinosaur “Jane,” a controversial theropod from the Late Cretaceous that is either a juvenile Tyrannosaurus rex or a separate genus of dinosaur called a Nanotyrannus. At CMNH, there is a skull of an animal remarkably similar to “Jane” whose fossils are on display at the Burpee Museum of Natural History in Rockford, Illinois. 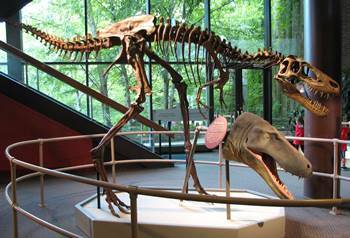 For years, the skull in Cleveland was presumed to be a Nanotyrannus, an animal very similar to Tyrannosaurus but much smaller, with more delicate features. When the more complete skeleton of “Jane” was found, paleontologists started the debate that continues today, and as of yet, no consensus has been reached, although the majority of paleontologists seem to come down on the side that “Jane” and the skull at CMNH are, in fact, specimens of a juvenile Tyrannosaurus rex. As guests walk toward the Kirtland Hall of Prehistoric Life, they will pass several mounts of ice-age mammals, including Smilodon, a glyptodont, a mammoth, a mastodon, and the giant North American flightless bird Diatryma, which is now referred to as Gastornis. Once inside the large Kirtland Hall, the space opens up to reveal a lot of prehistoric creatures. Large casts of Tyrannosaurus rex and Triceratops can be found in the center of the space, with large Jurassic creatures in another corner. 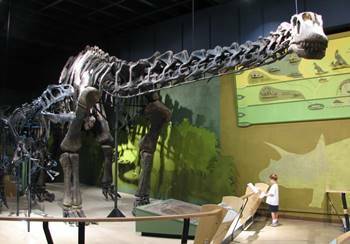 Of the dinosaurs on display, one of my favorites is the holotype fossil of a relatively rare Jurassic sauropod. Haplocanthosaurus was originally named in 1903 by John Bell Hatcher, but the CMNH specimen discovered in 1954 is the most complete and thus the type fossil for its kind. While it is not as huge as a Diplodocus or Apatosaurus, it is still an enormous animal. 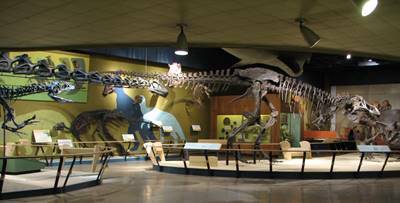 At CMNH, it is displayed next to an attacking Allosaurus, which adds some much-needed drama to the displays in Kirtland Hall, as most of the other dinosaurs on display are partial skeletons or casts of skulls, and they occupy the walls surrounding the main dinosaur mounts in the middle of the room. The Allosaurus mount is equally impressive; it’s posed next to the large sauropod with its mouth open, ready to rip at the Haplocanthosaurus if it can. Other dinosaurs on display include a skeletal mount of Edmontosaurus posed against a wall. A skull of its relative Parasaurolophus hangs nearby. 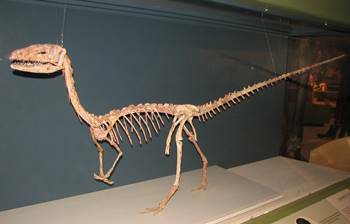 One of the most attractive mounts is a Coelophysis that was created from a few separate animals who were likely buried in a flood at what is now Ghost Ranch in Abiquiu, New Mexico. These specimens were first discovered in 1947, and later the CMNH received a block of fossils quarried from the Coelophysis “graveyard” that ultimately led to them being able to create this display–currently the most complete Coelophysis fossil mount in the world. One of the real highlights of the museum is the Devonian display. The Devonian period is quite early in the history of life on planet Earth, covering the time period roughly 420 million years ago (mya) up until around 360 mya. The oceans were teeming with life during this period, which is often referred to as the “Age of Fish.” One of the more remarkable animals to have lived during this time was a huge armored fish named Dunkleosteus. Found in the nearby Cleveland Shale formation, this huge member of an extinct order of fish called placoderms was an apex predator armed with incredibly powerful jaws. 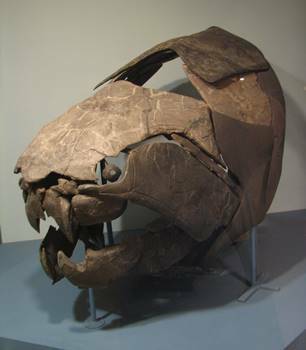 Instead of teeth, Dunkleosteus featured two huge bony plates that could chop prey in half with one bite. I was recently at a museum exhibit elsewhere that featured a mechanical Dunkleosteus, and the exhibit claimed that this interesting fish had one of the most powerful bites of any animal in history. Named after former CMNH curator David Dunkle, the Dunkleosteus is a favorite in museums worldwide, and many of those exhibits feature casts of the fossils that can be found in Cleveland. The Devonian display features more than just Dunkleosteus, of course. Numerous other fish and animals can be found here, including a large fish called Eusthenopteron. There are several large fish and marine reptiles from the Mesozoic Era as well, including an impressive display of the Cretaceous bony fish Xiphactinus, shown in a snake-like curving posture. Two of my personal favorite displays at CMNH depicted animals that preceded the dinosaur era. 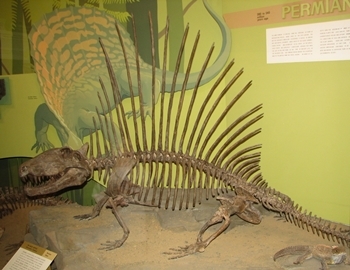 I love the famous sailback Dimetrodon, and the Cleveland specimen is a beauty. A contemporary of Dimetrodon was the amphibious animal called Eryops, a relatively large animal which sported a big, toothy mouth. While it is not a huge specimen compared to some, it is a really good-looking display. While the Kirtland Hall is not a particularly huge display area for a museum of this size, it does have some really good fossils and several that are rare or unique. If you like Dunkleosteus, Cleveland is the place to go to see this amazing creature. While you are admiring the other fossils, be sure not to miss the wonderful Human Origins Gallery. Also, watch for CMNH to update their progress on the new dinosaur hall, currently expected to be completed by 2020. While the logo for the CMNH is a nice-looking sauropod, the dinosaurs are only one part among many at the museum. Several of the exhibits were popular with my children: one was Balto, a dog with an inspiring story that was briefly a national hero back in 1925. The Human Origins gallery was renovated in 2013 and is terrific. CMNH curator Donald Johanson was the leader of the team that discovered the most famous human ancestor, “Lucy,” and the exhibit has much more about that discovery and its role in understanding human evolution. The physical anthropology research collection at CMNH is world class, currently lead by Yohannes Haile-Selassie. One exhibit that is very popular that we did not get a chance to visit is the Perkins Wildlife Center, an outdoor walkthrough exhibit featuring wild animals from all over Ohio. If you want to enjoy some nearby activities, University Circle is loaded with them. The Cleveland Botanical Garden is right next door and the great Cleveland Museum of Art is across the circle from CMNH. The campus of Case Western Reserve is a short walk, and there are good restaurants and music venues near the circle. The Kirtland Hall of Prehistoric Life has a lot going for it, but it does seem a bit dated. The layout is a little haphazard regarding the placement of dinosaurs and other creatures in their own time. Animals from each of the Mesozoic Era’s three periods (Triassic, Jurassic, Cretaceous) can be found in the hall, but it doesn’t seem like they are organized by time period. Fortunately, the dinosaur area is among those set for the 2020 renovation. The CMNH has helped produce a lot of dinosaur research, and I look forward to seeing some of the new discoveries on display when the new dinosaur hall opens. My oldest son visited with me, and he definitely had a good time. While he liked the Dunkleosteus and the dinosaurs, of course, he particularly enjoyed an area devoted to explaining the mining industry. It is very well done, as is the Human Origins Gallery. When we attended, it was a nice summer day, and the museum was packed with children. The Balto exhibit was popular, and many people were outside enjoying the Perkins Wildlife Center, which looks really great but unfortunately we just didn’t have time to do everything that day. Still, we look forward to returning some day, particularly after the dinosaur hall has been updated. This entry was posted in dinosaur museums, dinosaurs, Museum Reviews, Natural History Museums and tagged Cleveland Museum of Natural History, Coelophysis, dinosaur museums, dinosaurs, Dunkleosteus, Haplocanthosaurus, Museum Reviews, Natural History Museums. Bookmark the permalink.